Sea to Summit Comfort Light Insulated Mat. 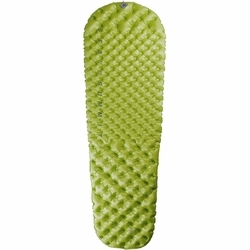 The Comfort Light Insulated sleeping mats feature hybrid layer Air Sprung Cell™ technology - a double layer of high-resolution cells in the torso for maximum comfort and insulation, and a single layer of medium resolution cells in the head and legs for reduced weight. Sea to Summit uses Exkin Platinum®, a quiet non-woven fabric, to reflect radiant heat back to the user and Thermolite® insulation to prevent convective heat loss between your body and the ground. All Sea to Summit air sleeping mats come with an Airstream Pumpsack, a repair kit containing six self adhesive patches for repairing punctures in the field, and a spare silicone one-way valve insert.